Seventy-one years ago, on December 7th, 1941, the Japanese attacked American forces at Pearl Harbor, killing 2,402 Americans, wounding 1,282, destroying 188 aircraft, sinking four Navy battleships, and, as the world later found out, awakening a sleeping giant. 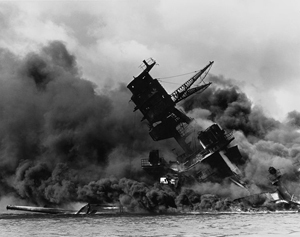 Tribute to the victims and to those who fought courageously in World War II should include some examination of how we got to Pearl Harbor Day, and how to not do that again. One American Navy man stationed in Pearl Harbor who survived the attack was Thomas H. Moorer, who retired from the Navy in 1974 as an Admiral. Moorer has too many impressive commendations and awards to list from his stellar and patriotic career, but you can read about him here. From August 1945 to May 1946, the Navy assigned Moorer to the Office of the Chief of Naval Operations, Strategic Bombing Survey, where his job was to interrogate Japanese officials. Among the questions Moorer asked was essentially: “how did you dare to attack us,” and “why did you think you could do that with impunity?” I’ll share their answers in a moment. On December 6th of 2012 in Dallas, Texas the Honorable Bob McEwen (former six-term Republican Congressman from Ohio) spoke at the annual Holiday Luncheon for the Park Cities Republican Women (PCRW). He articulated four categories or subject matter areas that can be assessed to measure the strength of a nation: Economic, Military, Political and Leadership. McEwen’s talk was stellar, informative, entertaining, a tiny bit frightening, and definitely eye-opening. The American military did their maneuvers in Louisiana and Texas using cardboard tanks. So what have our leaders learned since Pearl Harbor? Do today’s leaders believe that weakness invites aggression, or that it somehow buys peace? Today, according to McEwen, under President Obama, America’s Navy will reach ship levels equivalent to those of 1915, and the Army will be smaller than it was at the time of the Pearl Harbor attack in 1941, when we were the 17th largest Army in the world. In America’s budget battles of 2012, the Democrats intransigently and regularly lobby for cutting defense spending and increasing social welfare spending, in an almost irrational determination to weaken America’s defenses and security. This anti-national defense posture by the Democrat Party is on display against a backdrop of the rising power of the Muslim Brotherhood in Arab countries around the world, amidst the regular spewing forth of vitriol and hatred for America, Israel, Christianity and freedom by Iranian President Mahmoud Ahmadinejad, imams and radical jihadists, and against the ugly nearly totalitarian power grab by Egyptian President Mohamed Morsi. While none of these Muslim Brotherhood takeovers of Arab countries constitutes direct aggression against the United States now, they do represent the rise to power of ardently anti-American forces in the cauldron of the Middle East, posing a most dangerous threat to our ally, Israel, and ultimately to the US and freedom. Congressman Bob McEwen’s brilliant speech in Dallas in 2012 included repeated reference to the vital necessity for leadership to set the course and tone of a nation and its future. He pointed out that in England in the dark days after Hitler crushed the Rhineland, Austria, France, and Czechoslovakia, Winston Churchill came to power and changed the tone of leadership from the muzzy-minded Neville “peace in our times” Chamberlain to the “this will be our finest hour” clarity that led to the commitment to fight back against Germany. And despite the allied victory that came after America joined forces with freedom-loving countries around the world to defeat Hitler, the Brits saw fit to fire Churchill in the war’s aftermath (Britons were war-weary) and elect Clement Richard Attlee who served as Prime Minister from 1945 to 1951, and who set out at once to seriously weaken Britain’s armed forces, and did so. This led to the passing of the torch from England to America as the dominant political and military power in the world. Today, amidst the grave concerns all Americans feel over so many domestic issues, the budget cliff issue, the national takeover of the healthcare system, the out of control spending, the rapidly growing entitlement class, the pressure by the American Left to capitulate to more government control over almost everything, it seems that the national defense budget and the caliber and readiness of our American military is a back-burner issue. But as Admiral Moorer learned interrogating Japanese aggressors, weakness, and the appearance of weakness, is an evil to be avoided. It is dangerous. Remembering our Pearl Harbor victims and those who fought and died because of Neville Chamberlain style dithering that emboldened the Nazi aggressors should remind us all that we must demand that our leaders convey and portray a strong America to the whole world.